Q – Will RingLead be GDPR compliant for all customers before it is enforceable? A – RingLead has confirmed we will be GDPR compliant before the May 25th deadline. Q – What are some challenges you have faced with becoming compliant for GDPR? A – Gaining a clear understanding of how our customers will be affected was our number one concern. We know we are secure and we have the right policies being executed, but helping our third-party vendors and customers maintain the GDPR compliance was our biggest challenge. This involved collaboration and building new product features. Q – Can RingLead help as a third party data vendor? A – Absolutely. First, we can help identify the country the person is in. This can help expedite and flag if they request to be forgotten. Second, we make it easy to delete data for those individuals who request to be forgotten. Q – How many records does RingLead process? A – Over 3 Billion records in 2017. Q – How would a RingLead customer delete all personal information for a person requesting to be forgotten? A – Very easily. There are several product features available to delete data. In most cases, the data is not stored by RingLead, but in those cases when it is stored, the RingLead user has several options to delete any data quickly and easily. 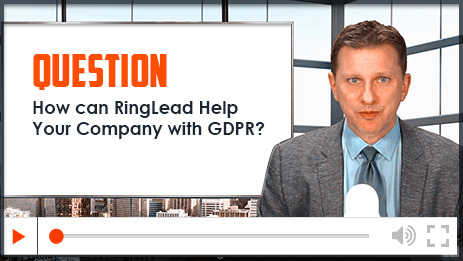 Q – Have you confirmed ALL RingLead vendors are GDPR compliant? A – We are in the final stages of this process. All vendors have confirmed our checklist and our signing our DPA. We have good relationships to continue to monitor and expedite processes to comply with the GDPR. Q – Do US Companies need to be concerned about the GDPR? A- Yes. However, there is help to facilitate compliance. Privacy Shield was designed by the U.S. Department of Commerce companies on both sides of the Atlantic with a mechanism to comply with data protection requirements when transferring personal data from the European Union and Switzerland to the United States. Visit www.privacyshield.gov for more information.